Coach 104 was built by the Crossen Car Co of Coburg, Ontario in August or September 1906 for the Canadian Northern Railway as their first class coach 142 with a capacity of fifty-nine passengers. It is 64’ in length with four-wheel trucks. It still carries its original Pintsch gas light fixtures, now electrified. The interior is finished with oak and mahogany paneling and trim. In 1919 it was renumbered 8002 and then in December 1921 became Canadian National coach 3402. In August 1954 it was sold to the Greater Winnipeg Water District Railway. There it first became Number 52 and, sometime in the 1960s Number 352. In May 1970 it came to the Prairie Dog Central as Number 104. From its beginning in 1867 to its demise in 1915 the Crossen Car Company, in its various forms, was a major supplier of rolling stock to most of Canada’s railways. It has been estimated they produced some 750 passenger cars in addition to freight cars and streetcars. 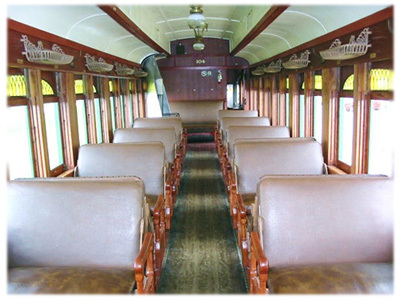 While several have survived with considerable modification, Coach 104 is the only Crossen passenger car that still exists in its original form and is the only operating example of a Crossen passenger car. The only major change made to the coach is that, at some unknown date, the stove was moved from the end of the passenger compartment to close to the centre. Probably as a survival move in a Prairie winter. In 1906, when this car was built, Western Canada and the Canadian Northern Railway were entering real boom years. Both Saskatchewan and Alberta had just been carved out of the Northwest Territories and were open for major immigration and settlement. The Canadian Northern had completed its mainline from Kamsack Saskatchewan to Edmonton which, along with other lines, brought a record 606 miles of new line into service in just one year. Needless to say, the CNoR was on a major buying spree for all kinds of new equipment and Coach 104 was one of an order for ten first-class coaches placed with Crossen. Unlike the CPR or the Grand Trunk Pacific, the Canadian Northern initially entertained no dreams of spanning the country from coast to coast as a later-day Northwest Passage. Rather they were determined to be a developmental road, opening up the Aspen Parklands on the northern edge of the prairie grasslands. These were identified as the most fertile lands in the West by Henry Hind in 1858 and were chosen by Sanford Fleming as the preferred railway route in 1871. Fortunately for the CNR and its settlers, the Marquis strain of wheat was developed in 1904. Maturing ten to fourteen days earlier than any previous wheat, this strain and the fertile soil made successful crops almost guaranteed in the northern farmlands. Coach 104 undoubtedly heard many conversations as farmers bragged about their harvests.